Miang Kana means “many bites”. It’s a street food from Thailand where you combine ingredients in a leaf and eat them together for a flavor explosion. It’s a fun dish for a summer party or BBQ! Chinese broccoli leaves, baby collard greens, wild pepper leaves, spinach leaves for wrapping. Dry toast all the dried shrimp by placing them in a cast iron skillet and stirring over medium heat for five minutes. Remove from heat and cool. 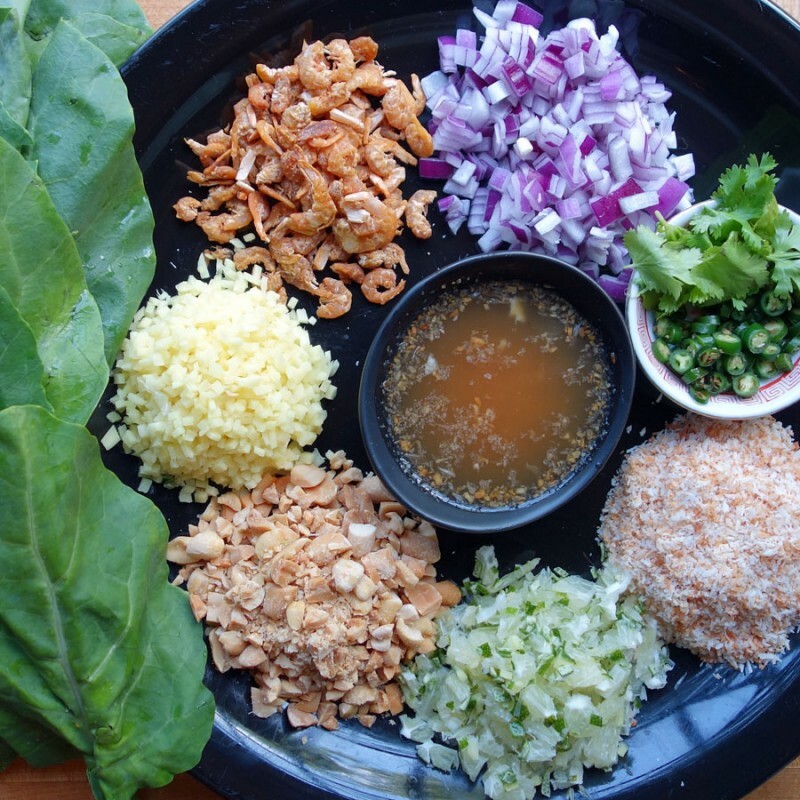 Place individual piles of each ingredient for the miang kana on a platter or large cutting board. Wash and dry the leaves and add them to the platter or serve them on the side. Prepare the sauce by mixing all the ingredients except the fish sauce and chillies in a small bowl. Add one tablespoon of fish sauce and taste. Add more fish sauce to taste or add water if the sauce is too strong. Add chili slices as desired. Place small spoons for serving in the platter. To eat, fold a leaf into quarters and open one of the pockets and spoon a mix of the ingredients in the leaf. Add sauce and place the whole leaf in your mouth. You can add or substitute ingredients. I’ve had it made with pork floss a dried shredded pork that you get in an Asian supermarket. I may develop a vegetarian version. Fish sauce varies in strength. I use the one with the three crabs on the label for cooking and I use Red Boat brand for sauces and finishing dishes because it has a more refined flavor.